SGLT-1/2 therapy for type 1 diabetes, hybrid closed loop systems in teens and children, and the importance of glucose control as an outcome in addition to A1C! Dr. Boris Kovatchev and his team from University of Virginia shared strong results from a ski-camp study, showing that Tandem’s t:slim X2 Control-IQ hybrid closed loop system increased time-in-range (70-180 mg/dl) by nearly four hours in adolescents (17-year-olds) and children (12-year-olds). This young group participated in a three-day ski camp, with about five hours of skiing each day. This remarkable improvement in time-in-range came without an increase in hypoglycemia. This improvement was far greater in adolescents (5.6 hours/day) compared to children (30 minutes/day). While the researchers do not fully know the reason for this finding, Dr. Kovatchev wonders if the teens were in closed loop for more time for some reason. Regardless, we are thrilled to see these positive results in such a young group and we will stand by to report back on this unexpected finding. Additionally, following the ski camp, 24 of the children continued to use the Control-IQ system at home. Over a three-day at-home use trial, time-in-range improved significantly with Control-IQ from 53% to 71% (+4.4 hours!) without increasing time below 70 mg/dl. Tandem’s Control-IQ hybrid closed loop pivotal study (with automatic boluses) is underway – see our trial watch – targeted for a summer 2019 launch. We’re glad to finally have this evidence to support what people with type 1 and their healthcare providers have been saying about SGLTs: you can truly feel the time-in-range difference with an SGLT inhibitor, and it makes diabetes management less burdensome. Read diaTribe’s article on using SGLT-2 Inhibitors to help manage type 1 diabetes here! A poster co-authored by Dr. Rich Bergenstal (International Diabetes Center) and Novo Nordisk scientists presented CGM data showing that reducing glycemic variability decreases time in hypoglycemia, regardless of average glucose. The investigators concluded that there is “likely significant value” in reducing large changes in blood sugar levels (glycemic variability) to decrease the risk of hypoglycemia. Researchers suggest that both glycemic variability and A1C and average glucose should be considered as important factors for blood sugar control and diabetes management. Studies like these demonstrate the value of CGM-based outcomes and support the need for additional outcome measures beyond A1C. 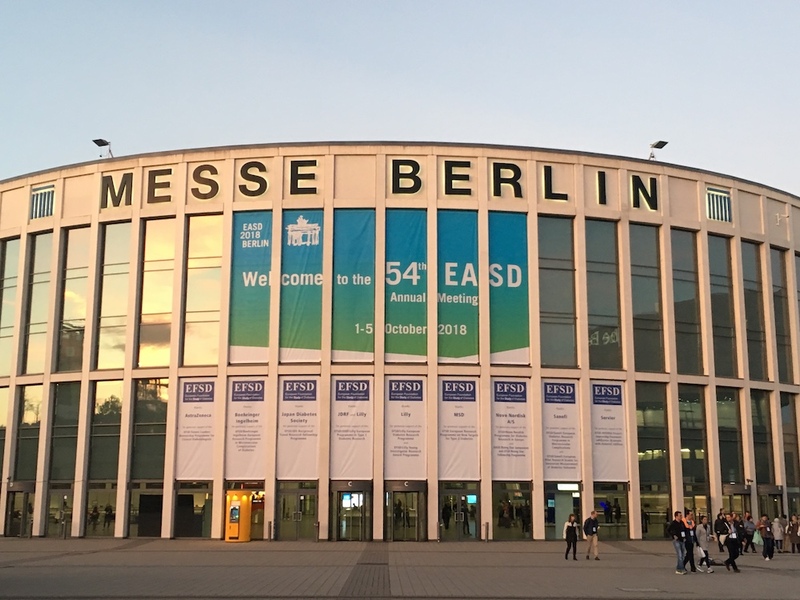 On Day 1 of EASD Dr. Bergenstal shared even more data that emphasized the importance of time-in-range and outcomes beyond A1C. We are very happy to see prominent doctors and educators begin to pay far more attention to “time in range” based on the very important work of Dr. Bergenstal and multiple other researchers. For more background on the Beyond A1C movement, click here. For day 1 highlights, click here.